essence and prevents restoration of HP. Numbing Mist blocks healing effects. This is most useful in PvP; if you can hit an enemy player with this, they'll be unable to restore their HP using Blood Vials! It lasts an entire minute, too, so this is a very powerful item to use, whether early in a fight or after you've already done some damage. On the other hand, you obviously need to be careful not to get hit with one of these yourself. This item also works against computer-controlled opponents; the most important of which are enemy Hunters and Vicar Amelia. You'll find six of them in the Cathedral Ward; use them wisely, since you'll need to acquire the Cainhurst Badge to be able to buy them. You can only hold 10 in your inventory. This is a valuable item, and you should think carefully about where and when you use it... and don't miss! Cainhurst Badge: This badge can be acquired from Annalise, Queen of Castle Cainhurst. It allows you to purchase the Vileblood weapons, armor and adds Numbing Mist to the Insight shop's inventory. 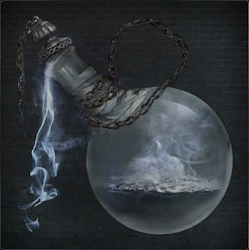 Numbing Mist can be used as "marker" to indentify invisible Witches of Hemwick during the boss fight or to distinguish real Mergo's Wet Nurse apart from its clones.